Recently, quite a bit of news has been published warning of a massive market correction or top that may scare you. Our research shows this is not the case. We want to set your mind at ease with regards to these fears they may be experiencing with some real research and price modeling that has proven to be extremely accurate over the past 5+ months. The research team at www.TheTechnicalTraders.com has continued to publish market research documents that have contradicted many of the largest research firms on the planet. Our small, but dedicated, team of analysts and researchers have spent years developing modeling systems that assist us in knowing what the markets will do in the future. In some cases, many weeks in advance. This helps us time our trades and select market sectors that are about to rotate well before the moves begin. In fact, on Friday we sent all the subscribers who joined our 1 or 2-year Wealth Building Newsletter plans our newest book “The Crash of 2018-2020 – How You Can Profit” which is exclusive to those member’s and we look two years into the future and what we should be aware of. In this post, we are going to highlight and illustrate why the fear that you may be reading about should be discounted – at least temporarily. Near the beginning of 2018, we were warning that a market pullback would take place after a strong early start to the year. We called this correction almost perfectly and we called the recovery almost to the exact bottom. We recently warned the US majors needed to pull back a bit before the next upside leg could begin, and this recent market rotation to the downside is the outcome of that prediction. Now, we believe the upside leg will begin in earnest and may surprise quite a few analysts and researchers. Many are expecting a retest of recent lows, yet our predictive modeling systems are telling us the US majors will move much higher, much quicker than many believe could ever happen. This first chart of the ES (E-Mini S&P) clearly shows our advanced predictive modeling system, the ADL system, is predicting much higher prices over the next few weeks. Follow the DASH lines to the right of the current price to see what our price modeling system is predicting. When you do, it becomes easy to see that we should expect a few more days of price rotation near the current levels before a new advance begins near March 8th or later. After this price advance begins, our predictive modeling system is clearly illustrating a moderately aggressive upswing towards recent highs before a bit of consolidation near March 16~20. Shortly thereafter, an additional push higher should be expected with a continued price advancement well into the end of March. The adaptive price modeling system shows even clearer detail on this Daily NQ chart. We’ve added a Fibonacci Retracement of the most recent price rotation to this chart to help our readers understand key price levels and how they relate to price action. Remember, the adaptive price modeling system is attempting to identify and correlate the highest probability outcomes from price action and technical indicator patterns. It does not care about Fibonacci or other types of price analysis techniques. The fact that the price modeling support levels (the heavy red lines being drawn to the right of current prices) are aligning with the Fibonacci 6711 level shows us that this level is likely key support going forward. The adaptive price modeling system is showing price advancement similar to that of the ES chart. A brief price rotation early next week, followed by a strong price advancement towards recent highs where price is expected to stall for a few days. Shortly thereafter, the price will begin to advance again to new highs. All of this is taking place within a similar time window as the ES chart analysis. 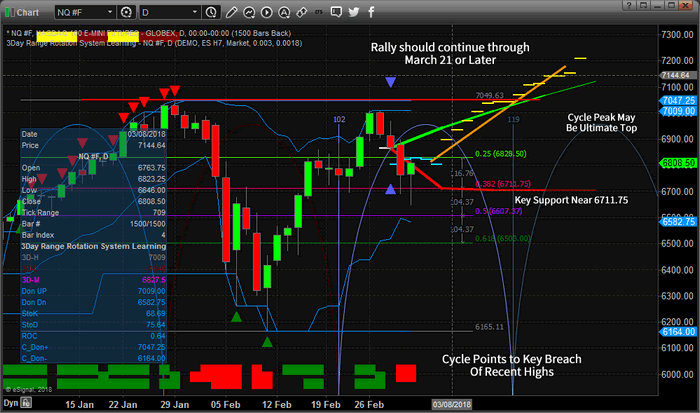 Price will advance to recent highs near the March 15~20 and stall for a few days. Then the price will continue to advance above 7150 in the NQ before the end of March. Yes, we are predicting a 350 point advancement in the NQ for those that are paying attention. Might be a really great trade sitting right in front of you if our research plays out again as expected. We share our analysis so that you have some real predictive analysis data for research and review. We are not always 100% accurate in our modeling systems predictions or accuracy, but you can spend a little time reading our research reports through most of this year to see how we’ve been calling these market moves since well before the start of 2018. Visit www.TheTechnicalTraders.com to see what we offer our subscribers and learn how we can assist you in finding great trading opportunities. In fact, pay attention to the market moves as they play out over the next few weeks to see how accurate our research really is. On Friday morning before the market opened, we showed subscribers a quick intraday trade that on the SP500 index that lasted only 3 hours and netted $650 profit to end the week. Bottom line, we’re confident you will quickly understand that we provide some of the best predictive analysis you can find and we are proud to offer you and members this type of research. In closing, don’t fall for the fear and panic articles. Yes, the market is extended. Yes, the market may correct sometime in the future. Yes, the Fed has likely created a massive bubble. But it’s not over yet and the real trade is this 350+ point rally that is set up. 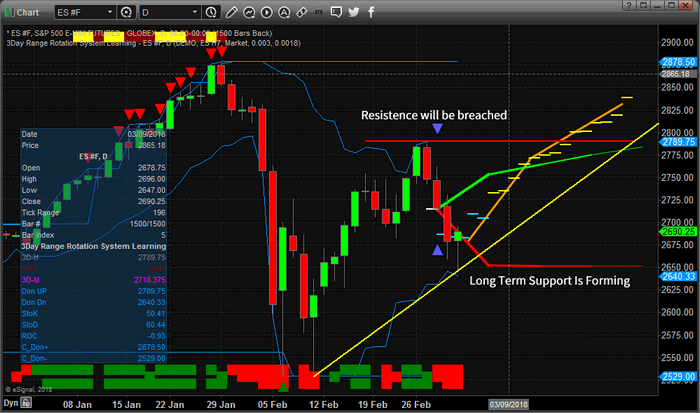 Hope to see you in our member’s area where we can share more data and research to help you profit from these moves – visit www.TheTechnicalTraders.com to learn more.